After exploring Llachon, we headed over to Copacabana, Bolivia. 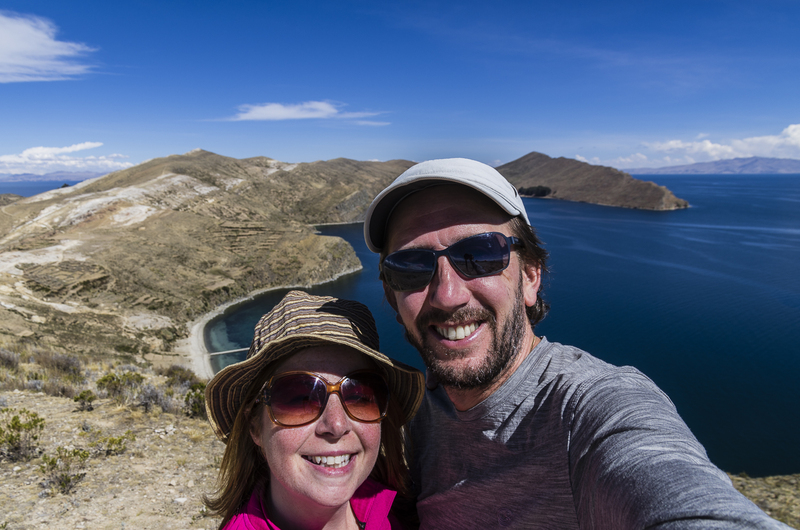 You can read all about our time on the Peruvian side of Lake Titicaca here. From Puno in Peru it is inexpensive and easy to catch a bus to Copacabana, Bolivia. If you pay a little more, you can have a tourist bus but it’s not really necessary. The trip will take you about 3 hours or maybe a little more depending on how busy the border crossing is. For a pretty inefficient country, we found the Bolivian border here surprisingly efficient! We passed through in no time and suspect they are used to dealing with the hordes of backpackers that come through. Copacabana is a compact town with quite a few tacky, touristy hotels and hostels. Avoid these no matter how cheap they are! The best place to stay in town, hands down, is at the unique cabanas Las Olas (see more information below). The city offers the visitor a nice lakeside shore (almost like a beach) where you can rent paddle boats or stroll idly around. There are also many stands serving fresh trout for very little. The main plaza has a beautiful church to see and you can also hike up to a hilltop to a mirador (viewpoint) and take in the expansive views. 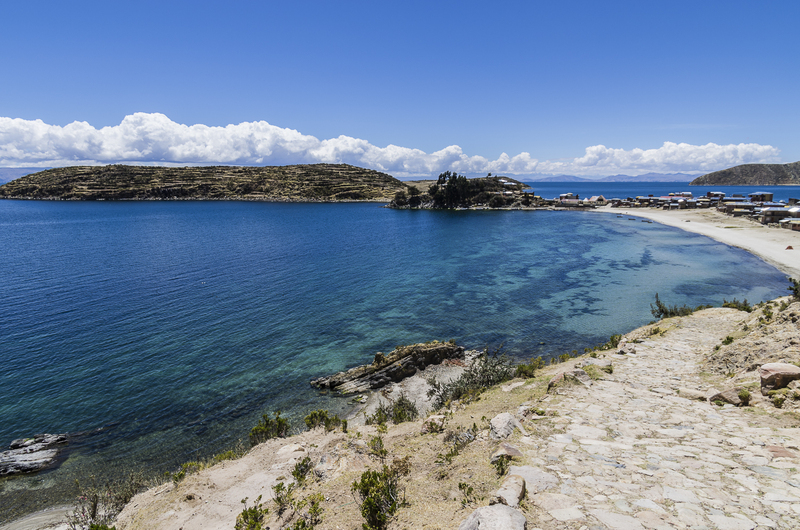 Copacabana also serves as a great place for exploring the nearby island of Isla del Sol. The island sits on the Bolivian side, right smack dab in Lake Titicaca and has a population of about 5000. We found that staying on the island was a great way to see the lake from every perspective. Isla del Sol has almost a Mediterranean feel to it and there are also some interesting Inca ruins to visit. My best advice is to have breakfast at El Condor & the Eagle Café in town, where they serve real coffee and fluffy eggs alongside homemade pan integral (multigrain bread). After eating, head down to the docks and catch one of the ferries that leave at 8:30 to Isla del Sol (there is a later ferry at 1:30 if you happen to miss it). Cost is 30 Bs. It is on this island where, according to Inca legend, Viracocha emerged from the waters of Lake Titicaca and created the sun. Looking up at the brightly shining orb creating sparkles all over the lake, I could begin to believe this. The ferry dropped us off in Challapampa (the first stop) on the northern part of the island. From here you can get out and walk to the nearby Inca ruins (one of which is the site of the sacred rock where the Inca creation legend began) then stop and have some lunch. The boat departs about an hour or two after landing in Challapampa taking passengers to Yumani in the south. If you feel energetic, you can easily hike, from north to south, the entire island over to Yumani. It takes just about 2 hours and is pretty easy. It goes up and down but mildly. Beware though, the uphill can be slightly more challenging than usual because you are up at very high altitude. Take it slow and enjoy. Yumani is much more built up and tourist ready than Challapampa, so if that’s your thing, you can bring your backpack and spend the night somewhere nice. Since we are types that prefer a more off the beaten path kind of atmosphere, we decided to stay in the north (Challapampa). Wherever you choose, I highly recommend spending a night or two on the island. It will give you time to just let the scenic beauty soak in and if you prefer quiet, serene nature (or have a tent to camp on the beach), then definitely stay in the north. If you like to have restaurants, more upscale accommodation and a backpacker-type vibe available to you-stay in Yumani. Everything is inexpensive on the entire island. Keep in mind groceries are severely limited, there are no ATM’s or banks (bring all the cash you’ll need) and the boat heads back to Copacabana only in the late morning and later in the afternoon. Night boats do not exist. Restaurants in both the north and south offer outstanding, quality trout prepared a variety of ways. Simple is best. Don’t miss the boat on this one! 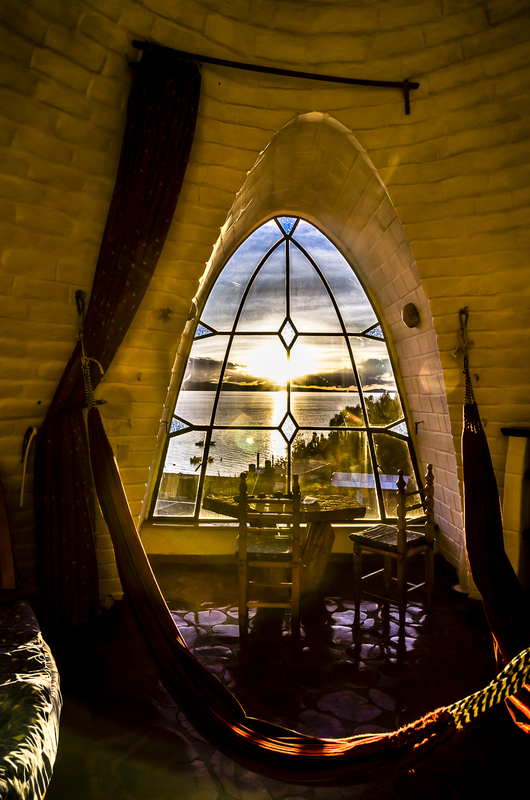 One of the most beautiful places we stayed in Bolivia was at Las Olas in Copacabana. Instead of a hostel or hotel, Las Olas is just a group of cabanas. Each one is full of character and hand-crafted by the German sculptor/owner. 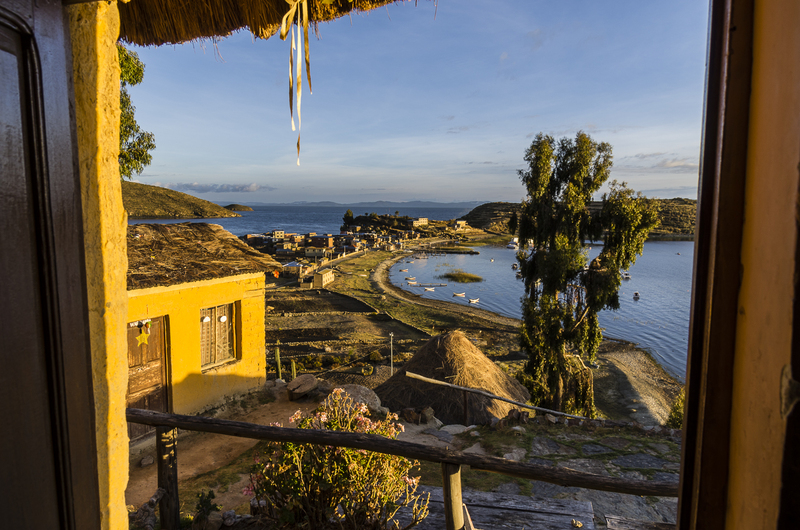 They all have a kitchenette, bathroom, hammocks and the best part is easily the impressive view over Lake Titicaca. Reserve in advance, as there are only about ten cabanas on the property. 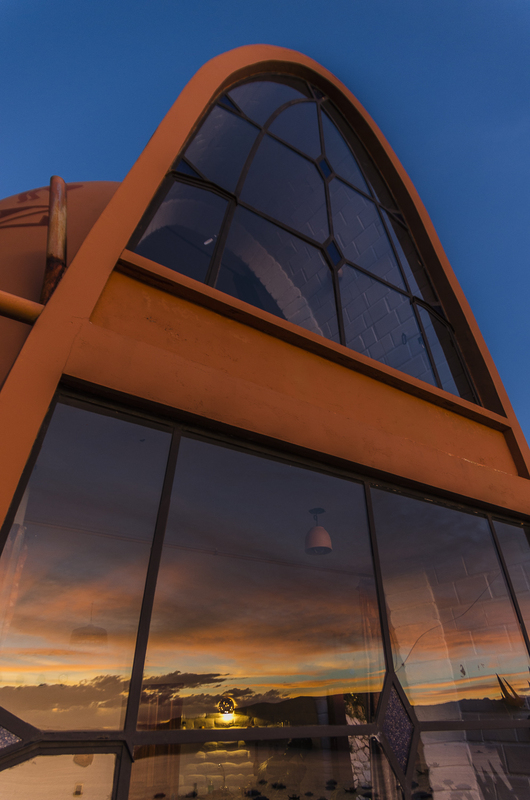 It’s pricey for Bolivian standards but at $40 US per night, it’s a steal. Trust me, when you are swinging in your second floor hammock while watching the breathtaking view of the sunset, that money spent will be the furthest thing from your mind. If you were waiting for someplace to splash out and treat yourself, this is it. A highlight of any trip to the lake includes watching the sunset. We saw gorgeous sunsets while we were in Llachon, Peru and now we were able to get another viewpoint here on the Bolivian side. This photo was taken right from our little cabana. 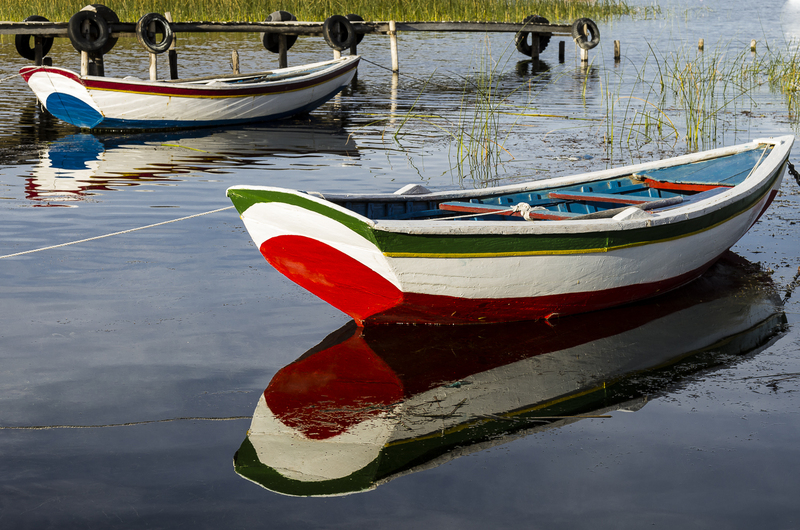 Crack open a bottle of a Bolivia Aranjuez Tannat wine, sit back and enjoy the lake in every color. It’s about a two and half hour boat journey from Copacabana to the north of the island in Challapampa. We didn’t reserve a place to stay in advance but found one easily enough. We walked uphill from the town in order to have a better view of the lake. Accommodations were very rustic but comfortable. When we woke up the next morning, we had this view from our window. Not a bad way to start the day. 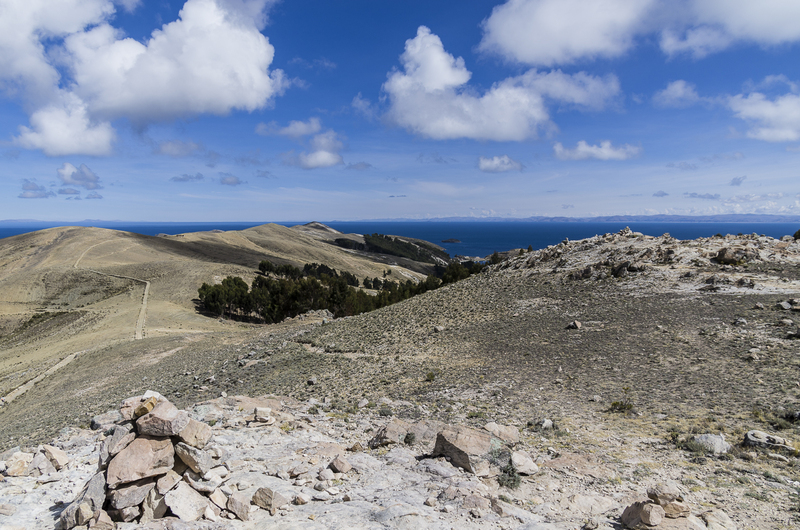 Isla del Sol is like no other place in Bolivia. It reminded us more of an island in the Mediterranean with it’s crystal clear, blue-green waters. There is some vegetation on the island, mainly in the form of small shrubs and occasionally some trees. In the south, there is a whole eucalyptus forest. The scenery was so different, sometimes we forgot we were in Bolivia! We spent our first day just taking our time and exploring the northern end. We visited the ancient Inca ruins as well as the sacred rock which is said to be the birthplace of the sun god. It’s nothing more than just a rock but the other ruins in the area were pretty cool to check out. My favourite part was at the northern tip of the island where you could climb up on a small hill. The lake stretched out forever. I felt I was staring out into the sea, it was so immense. The island is very easy to hike and due to its compact nature, you can go from one end to the other in just a couple of hours. On a clear day, you can see very far. There is not much shade so be sure to bring sunscreen and a hat. We left in the late morning and planned to have lunch on the south side. I was recommended a restaurant, Las Velas, to try. 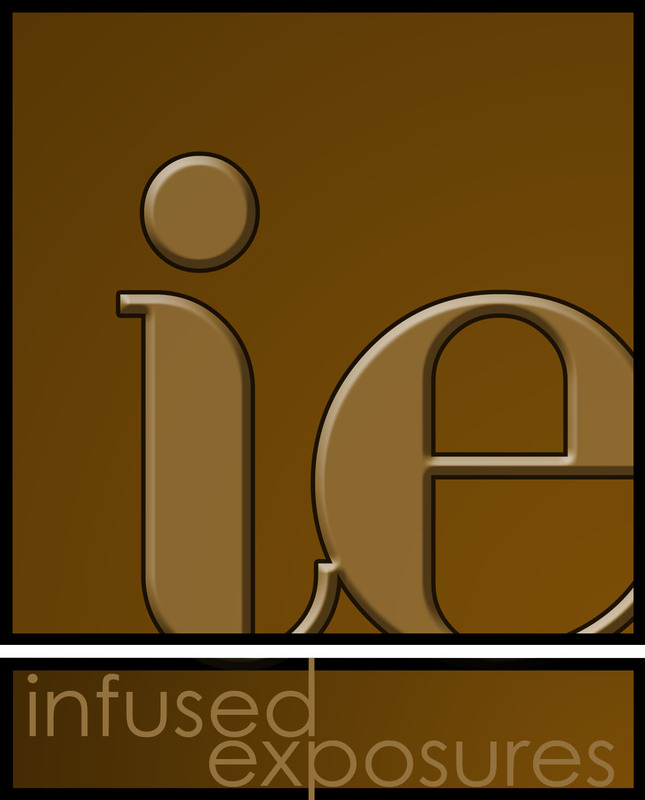 Unfortunately, they were closed when we arrived but if you are planning a trip, I heard from several sources that the food is outstanding. We had lunch elsewhere and you can’t go wrong with fresh trout anywhere on the island. Just a touch of lime and salt was all it needed. Walking along the main path from north to south, you see a lot of terraces on the natural slope of the land. 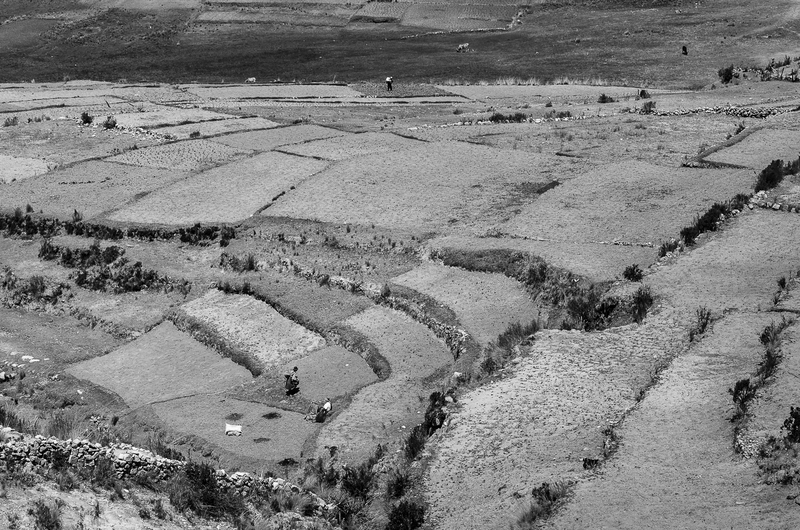 This method of agriculture has been around even before the Incas arrived. They helped perfect the system and it is still in place today. Life isn’t easy on this side of the lake either. They receive a lot more tourists here than in Llachon but are still dependent upon the lake and land for their survival. Almost everyone on the island owns one of these small colorful fishing boats. They are used for fishing and for transport to the mainland. The bright colors really seemed to pop against the blue of the lake. Watching sunsets is one of our favorite things to do ever. It’s a gift from nature every day. I used to watch them often nearby where I grew up on Long Island and we try to see as many as we can when we are travelling. 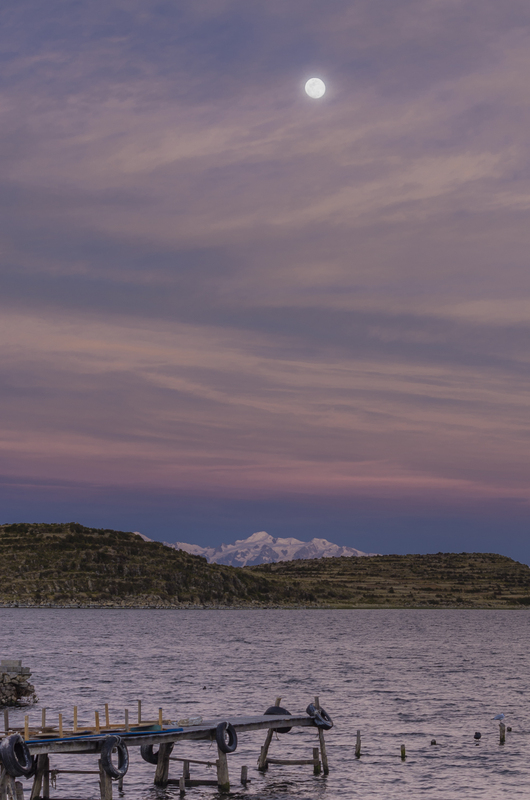 I have to say, that the sunsets over Lake Titicaca and especially those on Isla del Sol were some of the most stunning I have ever seen in my life. It’s worth a visit to this special place for that reason alone. What a magical place. 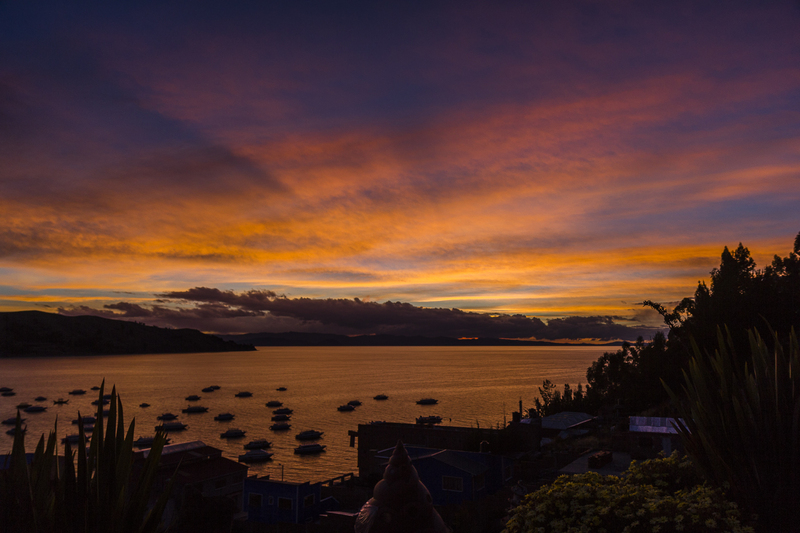 It’s hard to beat watching the sunset over Lake Titicaca. Amazing pictures! Definitely a highlight of both Bolivia and Peru! I miss those sunsets! Wow these pics are just amazing, you have really captured the beauty of Bolivia!!! !